Culture Abuse is a five piece band from San Francisco and Santa Rosa, Ca who formed in 2013. Culture Abuse features members of All Teeth and Dead To Me. Culture Abuse play a killer style of music that incorporates elements of punk, post punk, and grunge. Musically, Culture Abuse can be loosely compared to bands such as Nervous, newer Ceremony, Iceage, Single Mothers and other like-minded bands. Since their formation in 2013, Culture Abuse have released a six song 12" titled The Day Dreams Of Nothing in September of 2013 and a two song 7" titled Spray Paint The Dog in February of 2015. 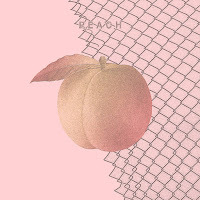 Peach is the band's latest full-length LP, which was released via 6131 records on April 6th, 2016. On Peach, Culture Abuse offer up ten tracks of catchy, grunge tinged punk, post punk, and grunge. Overall, Peach is a killer LP and is an absolute must listen for fans of punk, post punk, and grunge. Enjoy!